Your New Home - Love it More with EPS Buildings! Are you looking to build a new home that provides the custom, creative design you wish for along with the use of the latest in building technology? EPS homes feature construction using Structural Insulated Panels (SIPs), which are quickly becoming the desired choice for a lifetime of value and comfort. When it comes to design, all you need to do is share your idea of a dream home. High ceilings, lofts, large door and window openings—if you can dream it, we can build it. 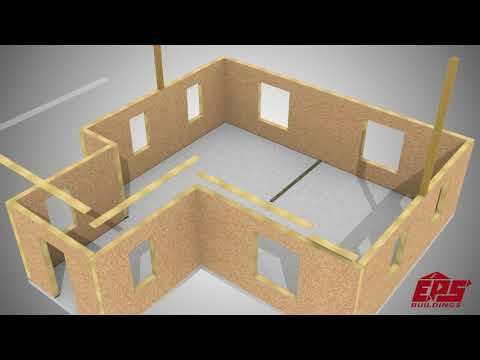 EPS can manufacture SIP panels in different variations to accommodate the desired R-Value performance as well as accommodating individual, unique designs giving you the freedom to have your new home built your way. The interior and exterior of SIP homes can be finished in any variety of ways including drywall, vinyl siding or brick. Energy Panel Structures can help connect you with a local builder who can help make your dreams come true - whether it is for a single family home, multifamily complex or a dream cabin. Energy Panel Structures offers 15 different pre-priced SIP home plans for single family homes. Take a look and find a home you'll fall in love with! Then give us a call and we'll get started! Your new home is built by a trained Independent Authorized Dealer--someone you already know and trust. Energy Panel Structures is an exclusive Andersen OEM Partner. What does this mean for you? We buy our doors and windows direct from Andersen, saving you money!